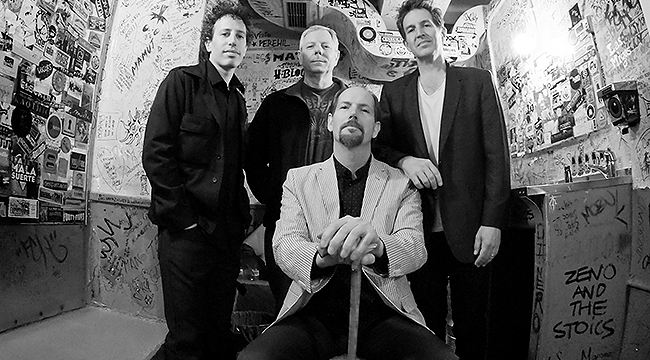 After playing a few dates last year in Spain, The Dream Syndicate, the L.A.-based garage/punk rock act fronted by singer-guitarist Steve Wynn, has booked a handful of dates in the US. Those dates will mark The Dream Syndicate’s first U.S. appearances since 1988. Wynn, who heads up the band that now features Dennis Duck, Mark Walton and Jason Victor, recently called us from New Orleans where he was vacationing with his wife after playing a few shows with his solo band, Steve Wynn & The Miracle 3. Talk about what prompted you to want to put The Dream Syndicate back together. I never ruled out doing Dream Syndicate again. When the band broke up in the first place, it wasn’t because I didn’t like the people or didn’t like the music or didn’t like what we had done. It was just because I wanted to do other things. I had The Baseball Project, Gutterball and other things. I just didn’t get around to it. Then, this friend of mine was doing a benefit for a cause that I wanted to help with. I wanted to do it and he asked if one of my bands could do. Both my solo band and The Baseball Project were busy, so I started thinking about it. I thought, “How about The Dream Syndicate?” He said, “Are you kidding?” I said, ‘No. Why not?” I then had to figure out how to do it, and I got in touch with the band mates and we did the show. Did you have to rehearse much? We got together a few days before the show. It came together very easily. When the band was around the first time, we began with a very specific type of music. We wanted to grow and evolve and reach new people and see how far we could stretch things. The great thing now is that we don’t need to do any of that. We are a museum piece. We don’t need to be anything but The Dream Syndicate. Every song we play is from 1982 to 1988 and it’s great to do it that way. It gives us great focus and we can use that narrow idea and just blow it apart every night. I always said if someone would have been making the music I wanted to hear, I wouldn’t have formed the band. We filled the void for our own amusement. You originally started playing music when you were at school at UC-Davis. How did you keep the momentum going after moving to Los Angeles? I’m from L.A. originally. I went to school at UC-Davis and I cut my punk rock teeth up there. I was fortunate to turn 17 in 1977. It was a good time to move out and find your independence and discover punk rock at the same time. The combination of discovering punk rock and garage rock filled my head with new ideas. By the time I moved back to L.A. in 1980, I wanted to put together a band. I had this music in my head that no one else was doing, which was this mixture of punk and garage rock and drone. I always said if someone would have been making the music I wanted to hear, I wouldn’t have formed the band. We filled the void for our own amusement. To what degree was the Paisley Underground movement really a movement? Is it a blessing and curse that The Days of Wine and Roses became your best-known album? That album seems like it was so personal. What’s it like trying to connect emotionally with the lyrics. I was a neurotic, self-involved 21-year-old and I wrote about the things you write about when you’re a neurotic self-involved 21-year-old. I wrote about very internal things like what does it all mean and where is my place in the world. By the time of Medicine Show, we had been out in the world and traveling the country and being turned on to new books and new movies and new relationships and new hazards. That’s why Medicine Show is more of a storytelling. Days is what concerned me at that age, which is to say me. What was your major label experience like? It was funny. People at the time would assume we went from the wonderful paradise of this cool indie label, which was Slash, to the big mean nasty label. A&M was very nice and encouraging of our extreme musical behavior. They gave us more encouragement than Slash did. But once it became apparent to them that we wouldn’t sell a million records, they lost interest. At one point, right before Out of the Grey, I met with our A&R rep, who was a nice guy, and told him I could show you a way in which this band sell 50,000 records and make money for the label. He said that was admirable but not possible. The way things are now it is okay to be a niche band. That shows how things have changed over the years. At that point, it made more sense for us to be an indie band because we just wanted to be out there working. And to this day, that’s what I wanted. I just wanted to be out there playing music and trying new things. If The Dream Syndicate were to release Days of Wine and Roses in 2013, what kind of traction would it get? It would just be another noisy indie band. I would like to think it would stand out because it’s a very good record. When we made it, it was just what a certain type of music fan was looking for. The reaction was so strong, it was exciting. It probably screwed us up a bit. There was a year there where you couldn’t pick up any magazine without reading about us. People were so happy the band had come along. We were a rock critic’s band. And we were a rock fanatic’s band. Now, a lot of people have gotten hip to that kind of music and that’s great and really cool. I meet a lot of young bands who talk about how important the band was to them. That’s part of the reason why I wanted to reunite. Even if we just do it this one time I want people to have the experience of what a Dream Syndicate show is like. We’re not going to belabor this thing. It’s just a chance to take the museum from town to town. We’re King Tut’s remains going from town to town. You’re just doing a couple of shows, right? We play Cleveland and Chicago and then in December we’re doing shows in L.A. and San Francisco with the Bangles, the Rain Parade and The Three O’Clock. It’s a recreation of a show we did in 1982 that was the peak of that scene. We’re going to do a version of that show some 31 years later. It’s exciting. We’re just doing a little bit at a time to hit the cities we like the most, have some fun and look for things that are interesting to do. We’re not going to belabor this thing. It’s just a chance to take the museum from town to town. We’re King Tut’s remains going from town to town. Is there any chance you’ll write new material? No, not at all. Eventually, maybe. We’ve kind of thought about it. We’re having fun playing together. Jason Victor, who plays in my solo band, has joined and it’s a really great fit. We’re clicking so well together and we talked about it. But that wouldn’t this time around. These shows are purely looking backward. Eventually, it’s hard to say. The great thing about this project is that I don’t need to do it. I have plenty of other stuff I’m doing. We do this when we want to and how we want to. If it happens again next year, great. We’ll just wait and see.